Marcus Rashford and Anthony Martial have offered their thanks to Louis van Gaal after the former Manchester United manager announced his retirement. Van Gaal, who also managed Ajax, Barcelona, Bayern Munich, AZ and the Netherlands in an illustrious career, revealed the news on Dutch TV show VTBL. 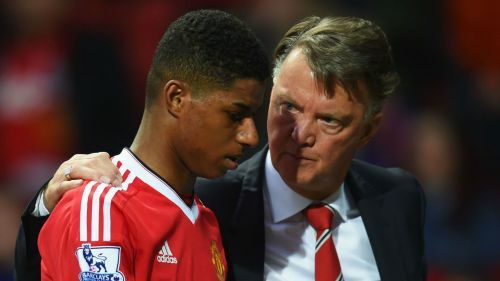 The Dutchman handed a teenage Rashford his United debut in February 2016, having signed Martial from Monaco five months earlier. And both players paid tribute to their former boss on Twitter, with Rashford writing: "Thank you for opening the door & trusting in me. Enjoy retirement boss." Martial added: "Thanks for everything coach !! It was a honor [sic] to learn from you!" Van Gaal won silverware at every club he managed, most notably claiming Champions League glory with Ajax during a six-year stint in the 1990s that also yielded three Eredivisie titles and success in the UEFA Cup, UEFA Super Cup and Intercontinental Cup. He went on to win LaLiga twice with Barca in the first of two spells in charge and earned a hugely impressive Eredivisie crown with AZ in 2009, before securing a domestic treble at Bayern Munich the following year. A second stint as coach of his country brought a third-place finish at the 2014 World Cup, while his two-year tenure at United ended two days after the club won the 2015-16 FA Cup.